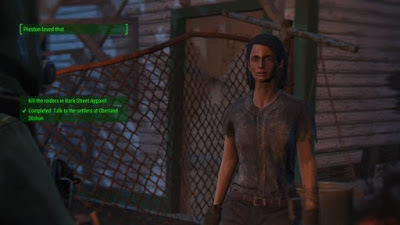 - In order to trigger this quest you need to sweep through the Corvega Assembly Plant, kill Jared, and return to Sanctuary to speak to Preston. He’ll pass this task on to you, and Oberland Station will appear on the map to the south of Sanctuary. - Make the trip to Oberland Station. There are things to do along the way, but it’s more or less a straight trip south from Concord. Take a right across a bridge once you see water, as well as a large population centre (Cambridge / Lexington) on your left. There are three Raiders on the bridge, and though they’re not immediately hostile, they’ll open fire if you get too close. Blow ‘em out of the sky. (They’re actually guarding Beantown Brewery; clear it out or ignore it as you see fit.) Head south from here to find the Station. - There are two Raiders out front of Back Street Apparel, and while that doesn’t seem like a huge deal, they’re also accompanied by a pair of Turrets - one on top of the entrance, the other in a shopping cart to the left of the entrance. They protect both sides of your approach, but you can get the drop on the baddies by coming through the alley between Back Street Apparel and its neighbour. Draw the Raiders away, kill ‘em off, then slip back to destroy the Turrets. - You’ll come out in a room with lots of places to hide, as well as two Raiders playing storytime. (Listen. The story is kinda horrifying.) You can easily get the drop on this pair from the right, though be careful, as there’s a hidden Turret on the left, behind the wall. Try not to make too much noise, as you’ll draw in more Raiders from an adjacent room. - Beside the Turret (or possibly the remains of the Turret by now) is a hallway leading to several useless changing rooms. Also here is a Novice-locked door, and if you pop it open you’ll find a storage closet. Inside is a toolbox with some assorted stuff, and, on a nearby shelf, a Stealth Boy. Ooo. - Return to the main room. There’s another door near the Turret leading to a hallway with a door two doors on the right and stairs on the left. Start with the stairs, as you’ll find some largely-unaware Raiders in the stairwell on the third floor. Take them down and keep climbing to find what looks like a flop-room, with, if you’re quiet, a sleeping Raider Psycho. You can easily catch him off guard. There’s a bunch of junk in this room (looootsa drugs, no surprise), among it a Grognak the Barbarian magazine on the table in front of the TV. There's a Master locked safe in the corner, also by the TV, with lotsa neat junk inside. - In the rear of this room are more stairs leading to a Novice toolbox (containing, quite frankly, a bunch of junk) and a ladder up to the roof. There’s some ammo in a yellow box up here, near the chair / couch. You can hop around the rooftops if you want, but given how easy it is to accidentally leap down to the street… and your death… maybe not? - Head back to the first floor now that all the potential baddies are cleared out. Assuming you didn’t scare her into an earlier battle, you’ll find the leader, Clutch, in the hallway with the two bathrooms. She looks like she’s alone, but there’s another Raider right beside her, hidden by a wall. An explosive should badly hurt them both, or you can just sneak up on ‘em. Regardless, not too difficult, assuming you finish her last. - If you come in here hidden you’ll see Clutch fiddling with a wall safe. If you’re not up to the Advanced lock on the safe you can hack the Advanced terminal connected to it to pop it open; inside is a bunch of ammo and some Pre-War Money. There’s plenty more ammo to find if you check the duffel bag and trunk in this room, as well. - Head back outside and zip over to Oberland Station. You’ll earn the loyalty of the Settler, allowing you to do whatever you want with the small plot of land. Return to Sanctuary and speak to Preston again to complete the mission, as well as start a new one: Taking Independence.